WFMU never makes habit of playing stale Christmas carols, but has its holiday traditions. Stan annually plays the entire first Rotary Connection album: this 1968 piece never made it to "classic rock" formats, but hear how its choral treatment of rock and soul covers has aged like fine brandy, taken out for special occasions. How about Holiday surrealism? Kurt Gottschalk filled in for Dan Bodah with Miniature Minotaurs, playing "Santa Dog '92" by the Residents. The big, digital production gives this track modern classical grandeur. Tamar filled in for Liz Berg, playing Meredith Monk, Hazel Meyers, and Billie Holiday on Are We There Yet. Nazario Scenario's Amanda filled in for Jesse, playing Bob Dylan next to Memphis Minnie, then Merle Haggard next to Chuck Berry. Amanda tilted these sets towards music distinctly rootsy and distinctly American. This is a fascinating gambit. A DJ's show sound is all in the DJ's choices, and Amanda creates her sound by linking organic sounding tracks of different genres. She uses genre without being boxed in by genre. This is just one way to skin the free form cat, but indeed an effective one . Hanson Records Promo Video from 1997. While you slowly wake up out of your post-holiday food/family comas in time to prepare for whatever New Year's Eve debauchery you have on the agenda, here's an indispensable Hanson Records "promo" video circa 1997 uploaded straight from the label's mastermind, the great Aaron Dilloway. This collection features some extremely rare performance footage of defunct Michigan projects, both featuring future superstars/mainstays of the 2000's noise underground, Mini-Systems (Nate Young of Wolf Eyes and Anthony Miller, a.k.a. HZMT) and Isis & Werewolves (Dilloway with Steve Kenney, later of Demons, and Andrew W.K., who I believe sits in on drums here) as well as some wonderful homemade films from Beast People (Dilloway, Young, and Twig Harper of Nautical Almanac), Ron Of Japan, and perhaps most fascinatingly to many, an early short film from Andrew W.K. (then going under his full last name of Wilkes-Krier) documenting the absurdist rocker/cult pop figure's uncomfortably bleak early travels through the dirges pof Michigan noise. HANSON RECORDS Promo Video 1997 from Hanson Records on Vimeo. It's Thursday, December 29, and the holidays have left their tread; heady drink and hearty food have all but rendered my mind and metabolism slug-like, and I can barely even remember what I did last week, let alone what records I purchased and bands I saw at the dawn of this (or any) annum. In lieu of summarizing this year in recorded music history, then, I will instead say this: My most anticipated release in 2012 is actually from 1973. It's the vinyl reissue of the Coloured Balls' Ball Power LP on Aztec Records, which I hear is due out "soon." While you and I await the long-overdue re-release of this seminal sharpie outfit's best album, we can feast our eyes on this video of the band ripping through a truncated version of "Human Being" on GTK in early '73. For those of you who can't wait or aren't particular about your media, you can also order the CD reissues of Ball Power and Heavy Metal Kid through Aztec Records' site -- or various distributors, like the ol' reliables at Forced Exposure. Now if you'll excuse me, time to ice my achin' head. Oh, and Happy New Etc. Gardenella Dingledart is Marge Gardenella, cello player for the weirdo Austin band Attic Ted. I have been following her on Soundcloud where she posts her lo-fi songs of mostly organ and voice. Her lyrics are dark, crass, funny and sometimes sweet, yammered and cooed over wheezing organ, farty sounds and rhythm box- a lot of it reminds me of the soundtracks to Cafe Flesh and Liquid Sky. My favorite track is "The Plague" where the tale of viscera and garbage flushed down the toilet is sung over burpy and manic classical figures and haunted house organ grinding. So many insanely great recordings have been Motherloded over the last year that it would take a month or two just to compile a BEST OF post heralding the best of the lot. Good thing I took stock last July to post my Mid-Year Favorites! Blessedly, this left me only half the calender to parse in order to select my Most Pleasurable Platters for the second half of 2011. See if you agree with my selections, and please do exalt your faves in the comments. Here's to bounteous insanity in 2012! Joe Harriott ~ "Free Jazz"
Ever notice how many crusty country honky-tonkers like Ernest Tubb seem to drink way more wine than you'd ever expect? Porter Wagoner comes to mind (One Dime For Wine, Daddy And The Wine, When I Drink My Wine) and so do Merle Haggard (Little Ole Wine Drinker Me, Wine Take Me Away), Faron Young (Wine Me Up), Johnny Bush (Back From The Wine, Waltz Of The Wine), and Bob Wills (Warm Red Wine) among others. These are, generally speaking, the kind of guys you'd expect to be throwing back beer and shots if you ever encountered them nursing a heartache in a bar somewhere. Yet they seemed to have an unshakeable affinity for wine over and above all other alcoholic beverages. Sure, there are lyrical and metaphorical reasons for this, but I find it fun to contemplate all the same. One of these days, I'll round up 10 or 20 of my favorite examples of this now-deceased trend but for today here's the Texas Troubadour himself, Ernest Tubb, with A Good Year For The Wine. I don't know about the rest of you, but at my house it was indeed a good year for the wine. And by wine, I mean beer. And speaking of Ernest Tubb, here are some selected excerpts from The Troubadour, ET's fan club newsletter from the winter of 1964. This fifth installation of the video compilation, Swing City, comes from WFMU's own Mike "The Good Doctor" Anderson. Fast forward to 2:40 to see some of the most insane girl-tossing swing dancing you've ever seen. Kudos to Irwin for pointing this one out. This installation has year end picks from heavy hitters like Liz Berg, Joe Belock and Rich Hazelton. For the rest of our year end favorites, click here. Much more below the fold!! I'm not sure how well he's known, outside of Chicago, but Orion Samuelson is a Chicago legend. It's possible that many readers are familiar with him, since the signal for his long-time radio home - WGN - reaches far and wide, particularly at night. Orion Samuelson was one of the first media stars - aside from perhaps Bozo - that I was aware of, when I was a little boy. At age six, I was an early riser, and one of the benefits of getting up so early was the chance to watch the exotic TV show "Top O' the Morning", essentially a farm report, hosted on WGN-TV by Samuelson and Max Armstrong. The subjects on the show were a complete mystery to us, but it was always made worthwhile when we got to hear that most bizarre and comical of phrases, "Pork Belly Futures". Flash forward another 45 years until today. Last year Orion celebrated his 50th anniversary with WGN radio, and is entering his 52nd year with the station. As of earlier this year, Pork Belly Futures are no longer traded, and his decades-long program "The Noon Show"- aimed at farmers who were in from the fields for lunch - ended almost a decade ago, but he remains the station's business and agriculture reporter, and can still be heard regularly on WGN, including his weekend Morning Show, co-hosted with, yes, Max Armstrong. 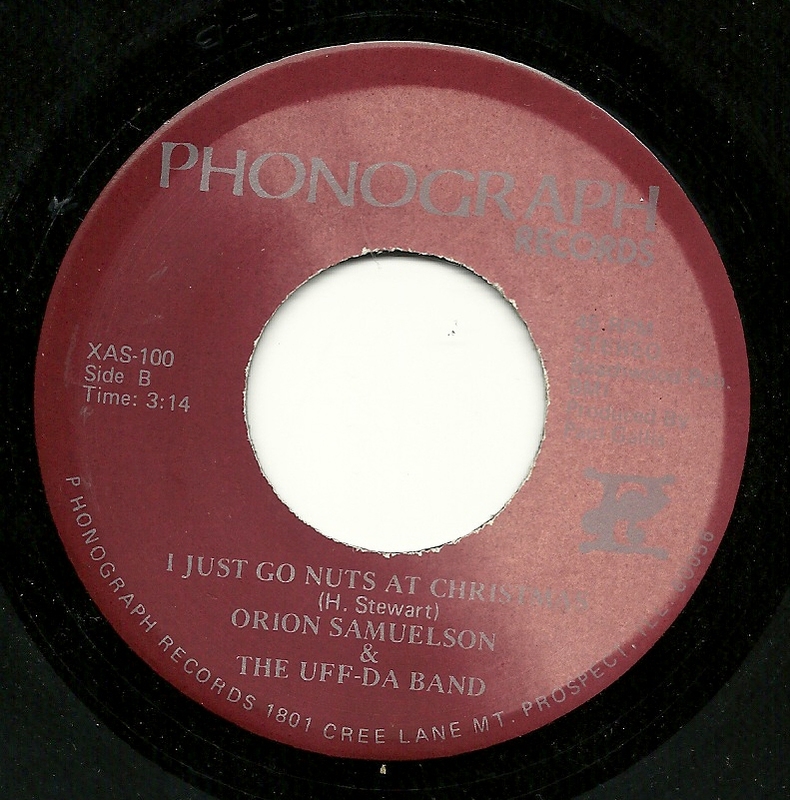 Knowing all of this prepared me in no way for my discovery last year of an unassuming Christmas 45: At some point in the 1960's or '70's, Orion Samuelson went into a recording studio, with cohorts going under the name of "The Uff-Da Band" (for the not-so-cleverly named "Phonograph Records" label), and recorded cover versions of Yogi Yorgessson's most popular record, the combination of "Jingle Bells" and "I Just Go Nuts at Christmas". 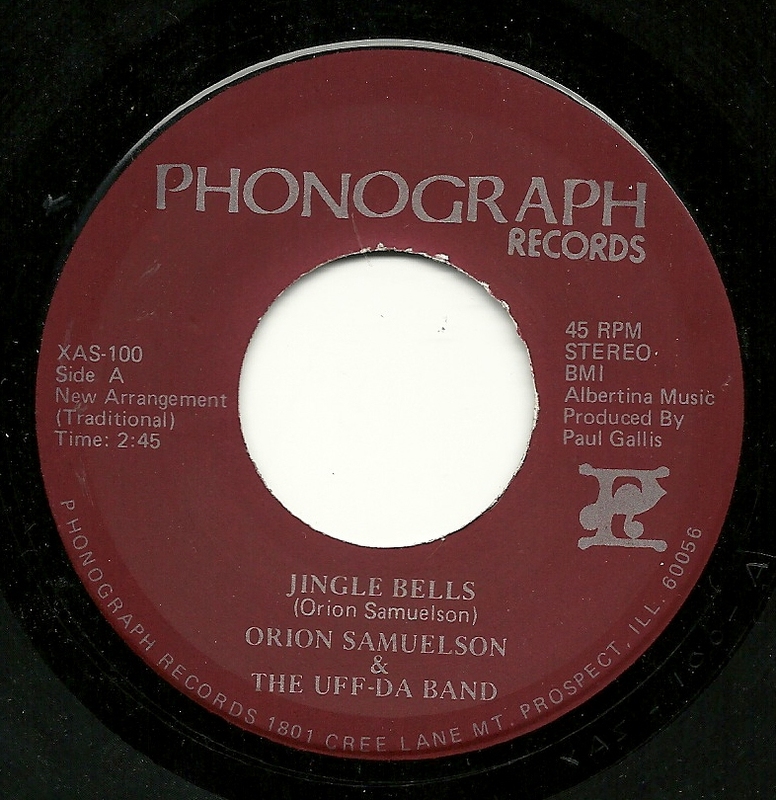 Curiously, while giving credit to Yogi (under his real name of Harry Stewart) for the B-side, Orion took credit himself for the arrangement of "Jingle Bells", despite its arrangement being virtually interchangable with that of Yogi's 1950's recording. Today a visit with the Rev. J. M. Gates, known for his beautifully-delivered sermons, recorded between 1926 and 1941, which vary widely in theme, tone and intensity. He can caress you on one 78 and then scare holy hell out of you on the next. He was one of the biggest-selling recording artists there ever was. One year ago I wrote this blog post about this song (and included a bad recording of it that I did using just Audacity and my little laptop speakers). Last week D.B. Fisher, the artist who created it, found my blog and wrote to me, asking for an mp3 copy, as none of his original recordings had survived. I was thrilled to oblige -- in a weird twist, I'd also bought his record "My Little Bomb" (r.) just the day before at a used vinyl shop because I recognized the name Emerson Bimby. After so many years I've learned the story behind the underground track, which I knew nothing about besides that it received some play on New York's WNEW. Fisher was living in a loft on Jay Street in December 1980, and recorded the song with his two roommates as part of an audio Christmas card for his sister's family stationed in Japan. The building where they lived is now Brooklyn Union Gas, and Fisher himself eventually moved to Hawaii as his neighborhood was bulldozed to build the Metrotech business improvement district. His experimental/new wave rock music, recorded in the late 1970s and early 1980s under Emerson Bimby, can be heard on MySpace. Check out D.B. Fisher's MySpace page here. Listen to a Christmas-themed show I did this week on WFMU's Give the Drummer Radio stream here. And happy holidays, everyone, no matter what geographic location your apartment is in! Some 32 years after it was filmed and shown to viewers in the U.K., it is easy to scratch our collective heads at how something as borderline surreal as the Kate Bush Christmas Special had a chance to see the light of day, let alone in 1979. Robert Florey's "The Love of Zero," is a zippy, lil' short tracking the, you guessed it, love of Zero. Zero's everything I want a 1920s film character to be -- a Chaplin-esque fella strolling around in an impressionistic world (silent, of course), playing on his trombone to impress a coy damsel. The damsel in question, Beatrix, immediately falls for the enthusiastic trombonist. What follows is a sweet story of their courtship, and the inevitable problem posed for the happy couple when Beatrix receives a letter instructing her to get back post-haste to the Grand Vizier's Palace (this was 1927, let's remember - Grand Viziers and their palaces of lusty sin were a part of the vaguely mainstream consciousness). The short incorporates some seriously stunning shots and innovative uses of film, back when film was still a relatively revolutionary medium. "Love of Zero," with its excellent jangly piano and trombone soundtrack, kaleidoscope shots, and genuinely sweet plot, is a welcome break from the inundation of holiday schmaltz we're all suffering from this late in December. Also, while a love story about Zero and Beatrix, it's one of the best odes to the trombone I've ever stumbled upon. Music need not be soul music to have soul: Monica played Donald Byrd's performance of "Blind Man, Blind Man," complete with chorus. Fascinating is how Byrd extracts the choral element from pre-soul, "square" music--Bing Crosby, Burl Ives, Four Freshmen-and adds swing and blues to make it hip. Compare Byrd's approach to The Freshmen singing "Holiday," played by Dennis Diken. The middle ground is Syd Dale's "Penthouse Suite," often used during 1960's TV "technical difficulties," played here by Bob Brainen. Cast this net wider and find a planet of soundtrack and "program" music revolving around funk, pop and lounge jazz. Nat Roe played Goblin from the score to Dario Argento's film, Deep Red. Rich Hazelton played Henry Mancini from the Touch Of Evil Soundtrack on Inflatable Squirrel Carcass. We''ll deal with much more of this music in the future, but finish by watching the below clip, with 1969 music by Jerry Goldsmith. Could this sound fit on a soul jazz album from the era? Absolutely! Picks in this installation from Bob Branien, Marty McSorley, Julie, Diane Kamikaze and Henry Lowengard. Find all of the best of lists here. Bob Brainen's picks for 2011. Back to the future Devo at McCarren Pool in Brooklyn on June 26, 2008. In conjunction with the release of their new EP Canyon Candy (on David Byrne's Luaka Bop label), Javelin with director Mike Anderson made this pretty great short film featuring lots of people getting shot. And in conjunction with that short film, there's a recreation of the film in installation form in Manhattan's Clocktower gallery. The EP goes down smoother than whiskey, I'll tell you this much. In related news, R Kelly wrote 32 new chapters to Trapped In The Closet. Javelin - 'Canyon Candy' from stereogum on Vimeo. Seeking the perfect soundtrack for tasing holiday shoppers? Desiring treacly seasonal sounds so corrosive your ears will need a dentist? Well you've come to the wrong place. We here at the Motherlode have zigged our annual zag through the minefield of abysmal Christmas albums in order to serve up our unhideous half-dozen Xmas platters for 2011. (Check out our picks for 2010 and 2009.) Have a happy listen and don't forget there are only 368 shopping days left before next Christmas. Listen to my radio show Give the Drummer Some—Tuesdays (6-7pm) and Fridays (9 to noon)—on WFMU's web stream Give the Drummer Radio. Send your email address to get on the mailing list for a weekly newsletter about the show, the stream and Mining the Audio Motherlode.